Indian Space Research Organisation (ISRO) on January 12, launched its 100th satellite today along with 30 others in a single mission. PSLV-C40 carred Cartosat-2 series satellite from the first launch pad in Sriharikota. ISRO also adopted an optimum separation sequence of all its satellites so as to avoid any collisions. India began countdown early Thursday for launching 31 satellites in a Polar Satellite Launch Vehicle (PSLV) from its spaceport here, said the space agency. “The 28-hour countdown began at 5.29 am in the mission control here for the rocket launch at 9.28 am on Friday,” said the state-run Indian Space Research Organisation (ISRO) on its website. The spaceport Satish Dhawan Space Centre, Sriharikota High Altitude Range (SDSC-SHAR) is located about 80 km northeast of Chennai off the Bay of Bengal coast. “The propellant filling operation of the fourth stage of PSLV-C40 is under progress,” said an update on ISRO’s website on Thursday. Commenting on the launch, AS Kiran, ISRO said, “During the last PSLV launch we had problems, today what has happened proves that the problem was properly addressed and rectified. Happy to give this new year gift to the country.” The four-stage PSLV-C40 stands 44.4 meters tall and weighs about 320 tonnes at the lift-off stage. The 31 satellites with a combined weight of 1,323 kg have been integrated with the PSLV for deploying them in the earth’s lower orbit after liftoff. Of the 31 satellites, three are Indian and 28 are from six countries: Canada, Finland, France, South Korea, UK and the US. The Indian satellites are 710 kg Cartosat-2 series for Earth observation as the primary satellite of the mission, along with co-passenger payloads, including 100 kg microsatellite and a 10 kg nanosatellite. About 17 minutes 18 seconds after the lift-off, the Cartosat-2 series will be separated and injected into its 505 km sun-synchronous orbit. The Cartosat-2 has been designed to stay in its orbit for five years. “The microsatellite will be India’s 100th satellite in space,” ISRO Satellite Centre Director M. Annadurai had told IANS on Tuesday. Among the 28 international co-passenger satellites, 19 belong to the US, five from South Korea and one each from Canada, France, UK and Finland. ISRO adopted an optimum separation sequence of all its satellites so as to avoid any collisions. The first space mission in 2018 onboard the PSLV-C40 comes four months after a similar rocket failed to deliver the country’s eighth navigation satellite in the earth’s lower orbit on August 31, 2017. 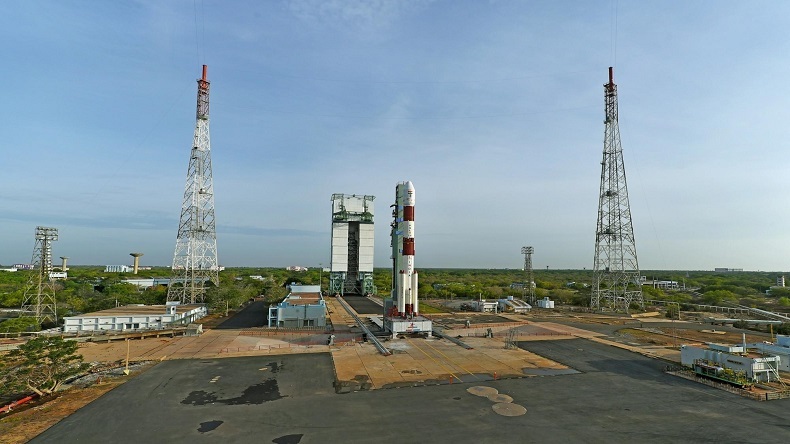 “The PSLV had a very successful run up to its 39th mission (PSLV-C39), which was a setback as the heat shield failed to separate,” Annadurai had stated. ISRO was holding all kinds of system tests to ensure that the problem does not recur in this mission, he added. “We have studied in detail as to what could have gone wrong and are making sure it does not repeat. With PSLV-C40, we are back in the game,” said Annadurai. As an observational satellite, Cartosat will beam high-quality images for cartographic, urban and rural applications, coastal land use and regulation and utility management like road network monitoring.